The American and Canadian Bosniaks strongly condemn and reject the American President, Donald Trump’s and the United States recent recognition of the holy land Jerusalem in Palestine as an Israeli capital city. Such a move is ill-thought, reckless and unwarranted and should not be supported by the Canadian government nor any other governments. This recognition of Jerusalem as the capital of Israel is also in breach of all international laws and the Peace agreements. The recognition of Jerusalem as the capital city of Israel will only contribute to further complications to the Israeli Palestinian conflict while fuelling further violence and instability in the region. Undoubtedly, this will be unhelpful in terms of prospects for peace in the region. 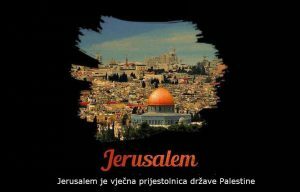 The American and Canadian Bosniaks are extremely concerned over this recognition and the change of the status quo of Jerusalem and the repercussions of it globally. We call upon the international community to take swift actions in rejecting this recognition and further actions in bringing an end to the Israeli Palestinian conflict through a just and non-biased approach.